When it comes time to add bulk storage, there are a number of considerations; tank type, tank size, with or without pump, electrical supply, space available, permitting requirements, and purchase price to name a few. Tank types can be further categorized as either permanent storage or temporary storage. Blank tanks, sometimes referred to as bare tanks or LPG storage vessels, are considered permanent storage and basically consist of an ASME tank with standard openings and steel saddles. Temporary storage, also referred to as semi-permanent or mobile storage has become increasingly popular of late. Skid packages are included in this category and provide the flexibility to move storage locations with relative ease. Skids consist of an ASME tank and saddles built on a steel sub-frame that includes the bulk head. Porta Paks are also in the mobile storage category and have found a niche in America’s oil fields and shale plays where flare capture requirements and declining oil prices have placed more emphasis on NGL transfer and storage. A Porta Pak provides storage on wheels as it comes with a trailer mounted ASME tank and all the standard tractor connections. Read on for more details about each of these tank types. Blank tanks for bulk storage usually range in size from 12,000 gallons to 90,000 gallons. The purchase price typically includes standard openings and steel saddles, but there is no bulk head, valve package or pump. Basically, just the tank and saddles. The up-front cost of an LPG storage vessel is less than other tank types, but there are additional costs to consider. Those costs include purchase and installation of a bulk head, piers and/or concrete foundation, a valve kit, a pump if needed, and any costs associated with the local permitting and approval process for permanent structures. 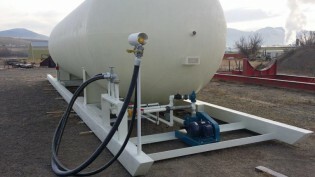 Skid packages can range in size from 12,000 gallon to 30,000 gallon capacity. Skids are generally the most expensive of the three tank types, but you get more with it; ASME tank, bulk head, valve package, service valves for liquid and vapor, shutdown system, and pump are usually all included. Skid packages are turnkey meaning just hook up electrical and you’re ready to go. Porta Pak tank capacity tops out around 18,000 gallons. The final purchase price will likely include a new ASME compliant, Nat’l Board certified tank. It may or may not include a pump, but that and other options can be added. Some states classify Porta Pak’s as semi-permanent and may not require it to be moved at all. Other states classify Porta Pak’s as temporary storage and require it to be moved after a year. Check with either the state authority or local fire marshal regarding your specific requirements.